The governor of Virginia, Ralph Northam, made news this week when he spoke in support of infanticide (not to be confused with his latest news). This followed the action of the governor of New York, Andrew Cuomo, who signed into law a bill that removed what little legal protections for unborn children existed in that state, now allowing abortion until the moment of birth. Cuomo and many of the state legislators who supported the measure identify as Roman Catholic. No one has been excommunicated by any of the bishops in New York. Cardinal Timothy Dolan, who claimed President Donald Trump's effort to enforce immigration laws "is not Christian", went public opposing excommunication for Governor Cuomo. In Virginia, the infanticide legislation was sponsored by Delegate Kathy Tran, and vocally supported by many Democrats, including Governor Northam. Tran has not publicly listed a religious affiliation, and Northam reportedly (and ironically) "attends a Baptist church with a largely black congregation." Several lawmakers in Virginia who identify as Catholic gave vocal support to the infanticide legislation. Only one, however, actually voted in support of the measure when given the opportunity. Not only does Delegate Michael P. Mullin list himself as a member of Our Lady of Mount Carmel parish in Newport News, Va., he also claims membership in the Knights of Columbus and its Walter Pollard Council #5480. The subcommittee vote to kill the infanticide bill passed by a vote of 5-3. Of the three delegates, all Democrat, who voted for infanticide, only Delegate Mullin identifies as Catholic. His bishop, Barry Knestout of Richmond (formerly the hand-picked consigliere to Don Wuerl in D.C.), issued a statement today, calling the legislation: "Horrific. Outrageous. Vicious." He made reference to the governor and sponsor of the bill, although not by name. Missing, though, was any reference to the delegates who actually voted on the legislation. Bishop Knestout has the authority -- and duty -- to excommunicate Delegate Michael P. Mullin for voting in support of the infanticide bill. The pastor of Mullin's parish and the Knights of Columbus may also wish to be vocal and specific about the lawmaker who claims membership in their organizations. 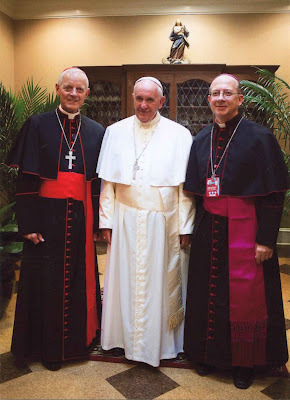 News releases and statements by bishops omitting names are useless. Laws do not magically get passed by faceless creatures with voting cards. Bills are voted on, and signed into law, by elected officials. Until elected officials who are on record supporting infanticide while identifying as Catholic are publicly excommunicated, the average Roman Catholic will continue to believe one can be pro-abortion while remaining a Catholic in good standing. Why should they believe otherwise?